What a wonderful dragon and I LOVE your background, lovely texture to it. This is beautiful Connie, I love the sweet dragon which is coloured beautifully too. What a cutie! I can't believe you made that gorgeous background paper. Love it! I have never used the bleach dabbing to make a background, looks doable but time consuming. However the end result is fabulous so well worth it.. Very nicely done NanaConnie, great card. Darling dragon. You've made him so lovable. So glad you joined us at Morgan's ArtWorld. Love the background Nana Connie! 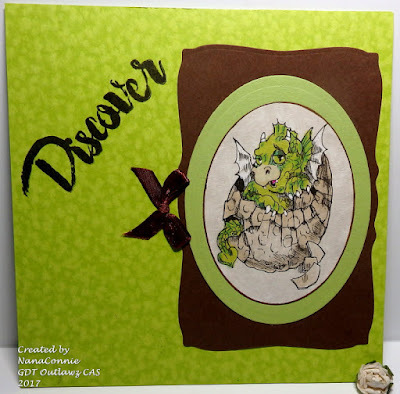 Thank you for sharing with us over at "Let's Craft & Create". Best of luck with your entry. Super card! Thanks for entering our 'Anything Goes' challenge at Bugaboo's Catch the Bug blog this week - good luck in the draw. Great background - not sure that I'd have the patience for it! Thank you for joining in the Clean and Simple Challenge at Incy Wincy Designs. Absolutely gorgeous! Thanks so much for sharing with us in the Let's Craft and Create's "Make Your Own Background" challenge!